I know the pressures they face are so much greater than I faced as kid in school. However, the God we love and serve is the same. And He is much greater than anything they will ever face. Love S.C.H.O.O.L? Also try H.O.M.E. or Pray A to Z through the whole alphabet! So, a few weeks ago, I sat down and came up with 6 verses to fit the acronym S.C.H.O.O.L. to help me remember how to pray for my children while they are at school. “Whoever believes in me, as Scripture has said, rivers of living water will flow from within them.”By this he meant the Spirit, whom those who believed in him were later to receive. As I pray, the verses run through my mind, and the S.C.H.O.O.L. letters become my prompt, even when I don’t have access to my Bible. Whether you have school-aged children or grandchildren or you just know kids who are in school, let’s join together in praying that our communities of children would have Self-control, Courage, Help from God, Opportunities to do good, be Overcomers, and above all Love God and others. We’ve made a fantastic printable of these verses just for you. Click here to download a PDF that includes the graphic above and a second page with the full verses listed. 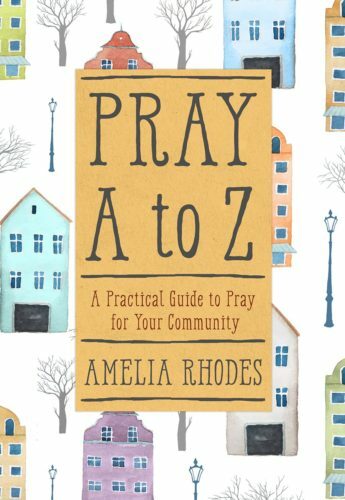 If you love this concept, you may also enjoy my new book, Pray A to Z: A Practical Guide to Pray for Your Community. In this book we have 5 topics per letter that include verses, prayer prompts and a short prayer to help you get started in praying for your community. You can find it on Amazon, or wherever books are sold. 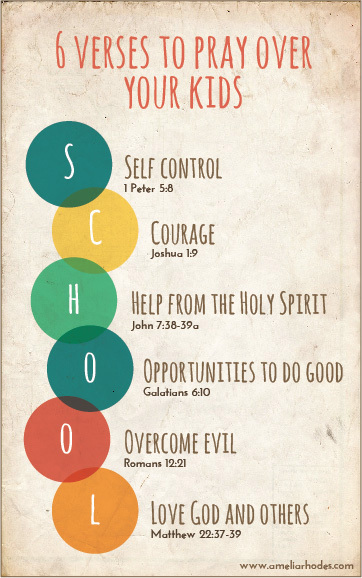 6 verses you can pray for kids this school year. Use the acronym S.C.H.O.O.L. as a prompt to pray for kids this year. This is a great reminder to me, to uplift the kids in the midst of busy. Thank you.